Schools spend so much time planning and strategizing for end-of-year campaigns that they forget about the importance of analyzing the results and using them to improve donor communications. Ensure that your school stays on top of its end-of-year follow up by putting the below suggestions into practice. Please download the document above to learn more about end-of-year fundraising best practices. Get instant access to this and more content! 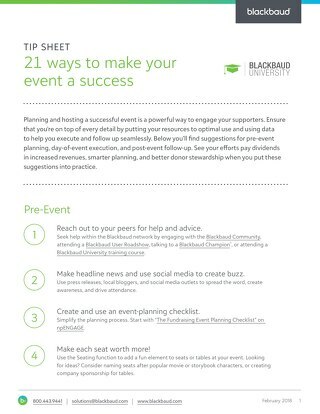 In this tip sheet, you'll find suggestions for pre-event planning, day-of-event execution, and post-event follow-up. Check out these tips to learn how to maximize online checklists in a student enrollment system to benefit both candidate families and your admissions office. Follow these tuition enrollment preparation and communication tips to put your school's families on the fast track to enrollment success. Check out these helpful tips for admissions-boosting CTA best practices when engaging prospective students and families during their decision-making process. Does it feel like your school is spending far too much time online trying to raise money without a proper return on that investment? Check out these tips to learn how to build an online giving system. Review these helpful tips to learn how to use analytics to conduct a content audit to fully understand the pages that are paddling forward and those that are anchoring the site down. The end of the year is the perfect time to step back and think about the goals you're trying to achieve. Use this worksheet to set yourself up for an inspired year of school marketing. 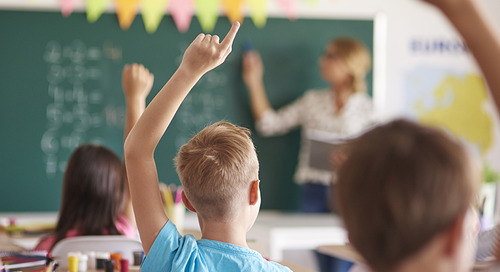 Review these tips to learn how to improve parent engagement in lower schools with Blackbaud Learning Management System. Smooth sailing during contract season is a great start toward the efficiencies of a fully connected system. Follow these tips to ensure a smooth enrollment contract process at your school. While the top technology tools will always have new contenders, the basic ethical guidelines remain the same. Review our tips to learn how to implement a digital citizenship program at your school. When is it time for a school website redesign? Wait too long on a school website redesign and it could hinder admissions. Start too early and you’re tapping into marketing funds better used elsewhere. Follow our eight tips to get the timing right. Does your school have a proper crisis communications plan? Review our six tips to make sure you haven't missed any important measures. Planning a giving day at your school? 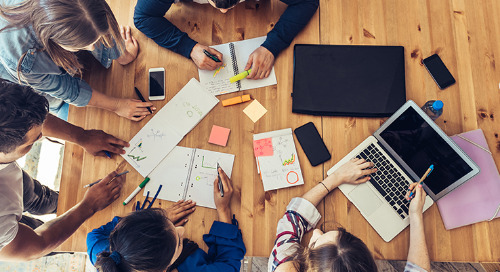 These featured tips from fundraising gurus at Blackbaud will help you concentrate efforts in the right areas to plan and run a successful one-day campaign. Summer is the perfect time to review communication wins and plan ahead for more storytelling opportunities. This checklist will help you plan for another year of content marketing success. It’s not easy to design a private school website when you don’t have the content in advance. This will help you create content that provides the most flexibility for responsive web design. Does your school have the right tools in place for a successful fundraising event? Check out some of Joe Garecht’s tips to help you raise more money from sponsors! Is your school's website getting overgrown and outdated. Check out these website landscaping tips to keep your site flourishing.